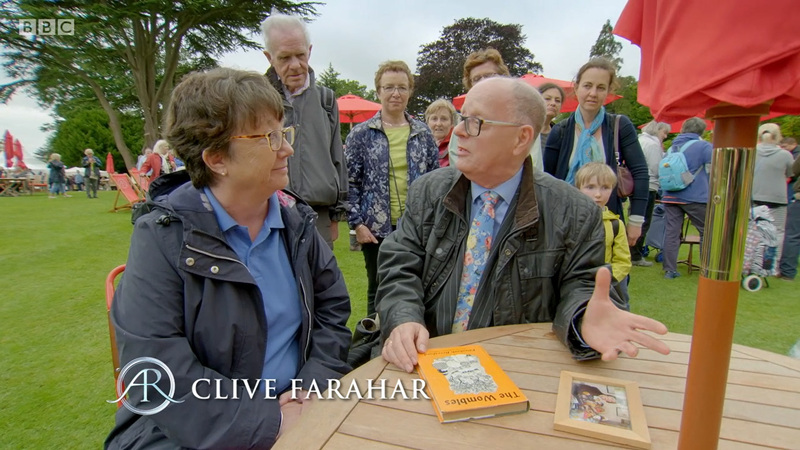 Kate went along to an Antiques Roadshow valuation day at the National Trust’s Nymans garden in West Sussex, where she was filmed meeting rare book specialist Clive Farahar. She showed him her copy of the first edition, with a personal message from her mother. The episode (series 40, episode 3) was broadcast on BBC One on Sunday 8 October 2017. Here’s a transcript of the two-minute segment. Clive Farahar: In the 1960s, we saw many things. Obviously The Beatles, but one of the most important things, I think, were the Wombles, and here is the first edition of the first book by Elisabeth Beresford. This one is actually signed, and it’s signed: “Love to Kate from Mummy and the Wombles. Elisabeth Beresford.” The author, who is..? Clive: And then she has a lovely PS here. “Bungo is really you in disguise. Hope you don’t mind!” So what is that all about? Kate: And so I’m afraid I was the bossy daughter, ‘cos I have a younger brother, who was Orinoco, the fat, lazy one, which is the one that all the children really love. Clive: And you’ve got a lovely picture here of Mummy. Clive: Mummy with all the Wombles themselves. Clive: This is the first time the Roadshow’s had an actual… a Womble, actually on the show, fully live here in front of us all. Clive: Value – I suppose we have to put a value on it. Well, a first edition I would have thought, a signed copy, a couple of hundred pounds, but I’m afraid this one is a very special one. This is to Bungo. £500. Kate: Really? Well, of course, it’s going to stay in the family. Clive: I hope so, too.